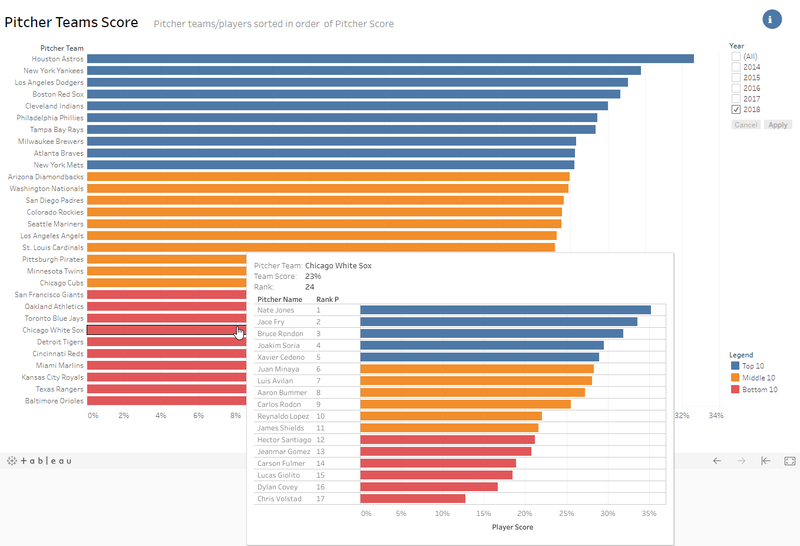 For the 2nd round of dashboards, the challenge was to use either 2 datasets relating to baseball. 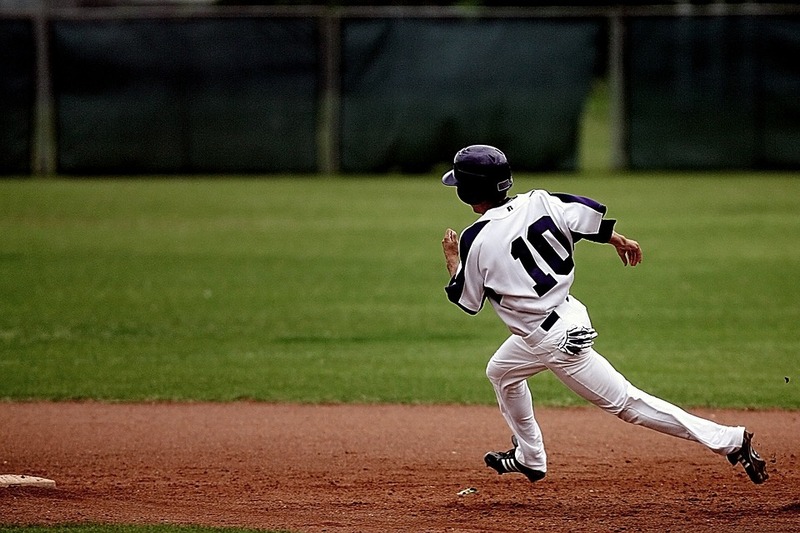 The 1st dataset contained information relating to players whilst the 2nd dataset covered information relating to the play. I went for the 2nd dataset as it had very specific information on the specifics of what happened during each play which I thought was interesting. I spent roughly 5 hours trying to overlay the zone locations with the corresponding ball hits, however later realised that the shape file wasn’t matching up with the latitude/longitude of the balls. It was at this point that I decided to scrap the concept and focus on another aspect in the data. I looked at the information for the pitcher team and player and chose to target this area. I initially wanted to compare team performance in terms of pitching and batting, however the bump chart wouldn’t work properly. As I was running low on time, I decided to focus solely on pitcher teams. I made a score for pitcher teams/players by calculating the strikeout % and subtracting this with the home run %. 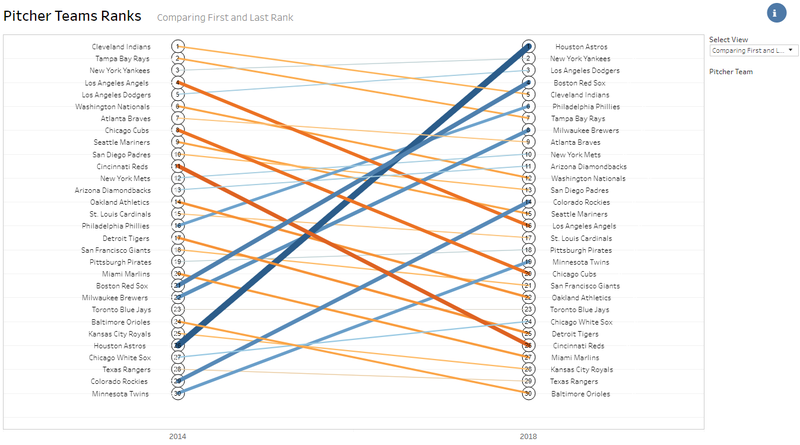 I made a bump chart showing the progression of team ranks over the last 5 years from 2018. 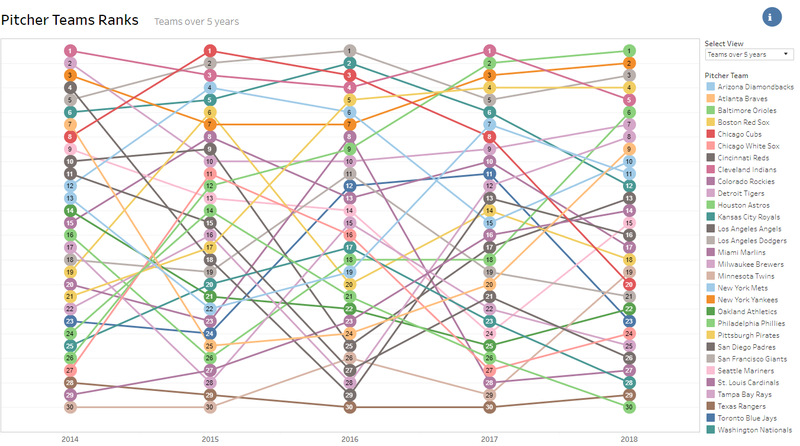 Since it looked a little clunky, I also made a separate view of a slope chart that compares 2014 and 2018 ranks. The difficult components of this view was getting the table calculations for the rank, colour, and size exactly right. It took a lot of experimenting to get the right combination. The second dashboard had a similar view to the first dashboard but showed the difference in scores between the teams. Hovering over the bars will show the team player’s ranked. Ultimately, I learnt the importance of time-boxing activities as I wasted a majority of my time working on a component that didn’t work.